That’s quite a nice wine! Use mine a lot. It is now over 20 years old and works well. Use it for cheaper cuts , but also for larger cuts. My butcher is very good as he will prepare by deboning, but not rolling. I also have a few vegetarian recipes for winter to produce stews…and dumplings! Prefer not to put wine in the cooking, rather matching when I have the result. When I have added to the mix, I had excess liquid. I thought you’d used that Burgundy when you first posted!! I had some friends over on Thursday for my 6 year olds birthday. Seeing as its January I am in the “eat less meat” zone so I made a lentil chilli. 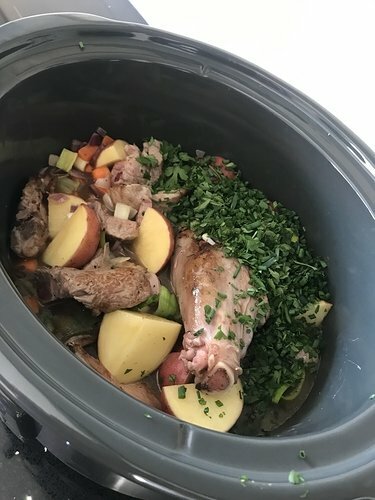 I just sort of made it up as I went along but it turned out great so I thought I’d post it here as it was slow cooker made. Chuck in a pre-heated slow cooker. Add the lentils, black beans, red kidney beans, sweetcorn, spices and seasonings to the slow cooker along with the chopped tomatoes. De-glaze the pan with the red wine and add to the slow cooker. Cook for around 4 hours or so. I think I cooked it on high …as I only put it in around 1pm ish but it will cook on low, medium or high . Christopher Snowdon blogging about the nanny state, smoking, drinking, vaping and the food police. Established 2009. Do you offer delivery of ready meals? For the freezing cold day that’s in it, -4 here on the school run this morning, I’ve just got this Irish/Lamb stew in the slow cooker . Shout if you’d like the recipe ! Potatoes, as many or little as you like. Thye will help to thicken the stew so bear that in mind. Cook the onion, celery and carrots in a pan until the onion is soft and transfer to the pre-heated slow cooker. Brown the lamb pieces before adding to the slow cooker and de-glaze the pan with the stock before adding that too. Chop the potatoes in quarters and add along with half a bunch of chives and half a bunch of parsley. Cook on medium for around 5-6 hours or until the lamb has fallen off all the bones. Remove these before serving and add the remainder of the fresh herbs and black pepper.